If you’re the child of an elderly parent, you’ve probably listened to your loved one speak those words or a similar sentiment signifying your parent’s wish to continue to age at home instead of moving to a long-term care facility. Truthfully, the majority of seniors want to remain in their own homes for as long as possible – for a variety of reasons. Home is the place they’ve lovingly created, so it’s where they feel the most comfortable. Living at home also brings meaning and purpose to one’s life. Something as simple as looking at one’s belongings, reading the mail, or relaxing on the porch are more meaningful in one’s own home than in a long-term care facility because it is the home that creates the framework of one’s life. The comforts of home offer a sense of tranquility and privacy that can’t be replaced. And yet, many people, old and young alike, are under the false presumption that life in a nursing home or assisted living facility is unavoidable for the elderly. Is it really possible to age safely and independently using home care services? Actually, in home care services can be a long-term, practical option for many. Living at home offers not only the comfort of familiar surroundings and independence from controlled schedules, but based on Genworth’s Cost of Care Survey, home care can be a much more economical option as well. 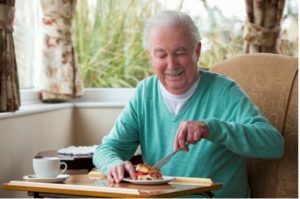 Review Needs for Basic Everyday Personal Activities: These activities are essential to caring for oneself, such as showering, putting on clothes, getting in or out of a bed or a chair, using the toilet, eating and ambulating. Review Needs for Activities That Help Maintain Independence: These are activities that include planning and preparing meals, managing money (writing checks, paying bills), shopping for groceries or personal items, keeping up a residence/performing housework (e.g. laundry, housecleaning), taking medications, using a telephone, taking care of mail and traveling by way of car or public transportation. Are Tri Valley home care services a possibility for your older loved one? Hired Hands Homecare can help you determine your senior care options. Our experienced and exceptionally qualified staff provide you with an alternative to placing a loved one in a nursing home or assisted living facility. Contact us today at (866) 940-4343 with any questions.